Not an easy question to answer. I’d say it’s more or less what I paid for it a year ago but still a lot of bread for a book which when used a lot will disintegrate.....For that very reason I’m in the process of scanning all the volumes (which they don’t like). Hi Michael! could you tell me what was happening on this day to this soldier and his Regiment please ? I know they were in action at Infantry Hill, Monchy le Preux at this time, as part of the Battle of Arras but wondered if you could tell me details - I'd appreciate your help! Private Ephraim Warner, 31487, born in Steeple, Essex. Enlisted in Southminster, Essex. Killed in action France & Flanders, 14/4/17. Background information from J.W. Burrows, Essex Units in the War 1914 – 1919, Vol. 1, 1st Battalion The Essex Regiment, pages 111, 112, 113, 114, 115 & map coming up. If you follow this link, you will find even more information on the battle of Monchy-le-Preux from earlier threads. These will give a far broader idea of what went on at the time. You can also type 'Monchy' in the search engine & find even more information. My apologies for the poor quality of the scans. Not what I usually post, but there is a restriction regarding the size of the scan. If you would like to have quality, please send me your e-mail address and I’ll send them to you. Sorry, not quite the correct sequence, but it is all there. What can I say? You Essex boys REALLY ARE the best!! A further snippet. The International Red Cross register of missing soldiers published in 1917 shows him as serving with Y Company 1st Essex. Interests:Local historian specialising in East of England (Essex, Hertfordshire and Suffolk) and vintage postcards. My book "Postcards from the Front: 1914-1919" has just been published by Amberley. "Postcards as a medium of correspondence became popular in the early years of the twentieth century. This soon became a flood as hundreds of thousands of postcards found their way into the postal system as the Edwardian era progressed. With the outbreak of the First World War in August 1914, it was only natural that the sending of postcards would spill over into the battlefields of the Western Front and Britain’s Home Front. The book also includes extensive appendices on how to identify and research postcards from the battlefields of the First World War, to reveal the story of your own ancestors’ war." Captain Frank William Bacon, 1/5th Essex Regiment died on December 4 1918 aged 36. He was promoted to Captain "early in 1915". He served with the 5th in the Dardanelles, Suvla Bay, Egypt & the first battle of Gaze in March 1917 He was wounded for a 3rd time in November 1918 and died from the effects of his wounds. Captain Frank William Bacon, 1/5th Essex Regiment died on December 4 1918 aged 36. Hey, I’m glad you’re researching Essex men. The more the better. a list of your men, I’ll look them up for you. I daren’t post the (downscaled) scans here, until I know where all the others have gone! As always coming up trumps. Hope you didn't mind me pointing Kate in your direction as she is researching the Mem in Gt Dunmow just up the road from me. I have offered to do her look ups for 1st and 2nd Essex - courtesy of your scans and some of my Diary extracts - takes some of your work load. Hopefully together we can sort out all Kates Essex lads. Have a great Xmas Michael and keep in touch. I can't believe the kindness that is on this forum. Although not a newbie when it comes to local/family research, I'm a total amateur when it comes to army research so am hampered by not knowing what’s “out there”, so I’m very pleased that you both can help. I’ll PM you both my proper email address and the list of “my” men. Capt Bacon is becoming quite personal to me as I’ve seen a few photos of him – sadly he was one of the original members of Great Dunmow’s War Memorial committee elected in May 1918 but he ended up as one of the names on the memorial. We certainly will...good thinking to divide the chores. And, anyone is welcome for look ups. sadly he was one of the original members of Great Dunmow’s War Memorial committee elected in May 1918 but he ended up as one of the names on the memorial. What irony! Not the sort one wants to see…I got your list Kate, will start on it soon. Merry Christmas indeed, we’ll enjoy and remember. Thanks Michael. Of the men on Dunmow's war memorial that I've postively identified over 1/3rd were in Essex regiments with many of the Dunmow lads in the 1st/5th & 5th. Sadly it is all too obvious exactly where the battalion fought as you just have to look at the places where the men of Dunmow are buried. Michael and Glyn - thank you so much for all the scans you've sent me. There is plenty that has given me a lot of "food for thought" and some new leads for me to follow up. The info you've sent me will certainly keep me quiet for a bit! I have joined the slippery (if not expensive) slope of buying regimental books. Today in the post was a very nice copy of Lt Col Tom Gibbons "With the 1/5 Essex in the East". If any one wants a look up - please shout. Tom Gibbons was a Dunmow man born and bred - quite a few of the lads on the Dunmow memorial were in his btn. Many he knew from his (and particularly their childhood) - sometimes his excellent narrative style of writing slips and you can see some of the anguish he must have faced seeing his life-long friends killed. "Poor young Jack Bartley, whom I had known from a baby - "Jock" as his pals called him in the mess, where he had so often delighted us with that magnificent voice of his - fell gallantly leading his platoon to victory". What he doesn't say is that "Jack's" father and he were very old friends and spurred many times in the 1890s and early 1900s when Jack's father was the judge for the Dunmow Flitch Trials and Tom Gibbons was "Counsel for the Bacon" at the same trials. Lt Col Tom Gibbons certainly did know Jack from a baby. 2nd Lt Frederick John Bartley (Jack) is one of the 84 on Dunmow's war memorial. Attached is a photo of Lt Col Tom Gibbons & his wife's grave in Dunmow churchyard (he died in the 1960s). You can see that Tom Gibbons gravestone has been restored at some point quite recently. 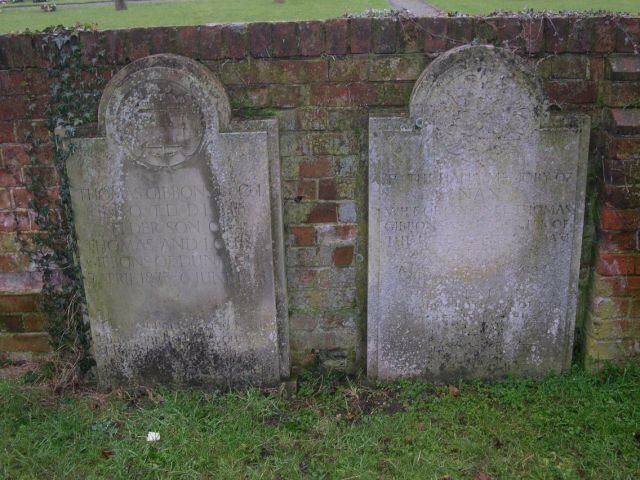 The graves are in a prominent place worthy of a good couple. have joined the slippery (if not expensive) slope of buying regimental books. Today in the post was a very nice copy of Lt Col Tom Gibbons "With the 1/5 Essex in the East". If any one wants a look up - please shout. Ouch! That is a great buy. Kate, does it have an index and a complete roll of casualties, honours, etc? But very useful appendices with Casualities (Killed, dow or died in hospital); wounded; and prisoners of war. All with dates for all ranks. Also full list of honours & awards and list of officers (& dates) that served with the battalion. I think they invented this after 1921 or so...thanks Kate. Volume 6: Service Battalions, The Essex Regiment (9th, 10th, 11th, 13th & 15th Battalions). Is there any mention of 15837 Private Albert E. Harding, 11th Essex (arrived F&F 4th October 1915)? He later served with the Royal Scots. He served with the RAF in WW2. Could you search for these chaps? Nothing on Pte. William Hickox MM, 10th Battalion I'm afraid. The following on Major Edwin Baskerville Hickox MC, 10th Battalion. When the 9th Battalion The Essex Regiment embarked for France on 25 May 1915, one of the officers was 2nd Lieutenant E .B. Hickox. At the beginning of October 1915 the 9th was in the trenches near Loos and Hill 70. In the late afternoon the Germans suddenly attacked but an officer had noticed some preparations and had alerted his Company. During the ensuing fight Lieut. Hickox took command of "D" Company for a while as the C.O. of this Company had been killed. July 3, 1916 the Battalion attacked Ovillers and the Battalion Commander " especially mentioned Captain E. B. Hickox for the handling of his company during the main attack on Ovillers. Though survivors of the leading battalions were passing through, he held to his position and went from one flank to the other to keep himself informed of the situation, regardless of his safely." " The 9th Essex accordingly took over all the Brigades positions, but had hardly settled down, when, in the early morning of July 8th, a German attack caused prompt retaliation in which splendid work was done by "B" Company (Captain Hickox) and C.S.M. Waters." " Here, on August 15th, a serious bombing accident deprived the Battalion of two officers and eight other ranks, of whom the two officers (Major Edwin Baskerville Hickox, M.C., and Lieut. 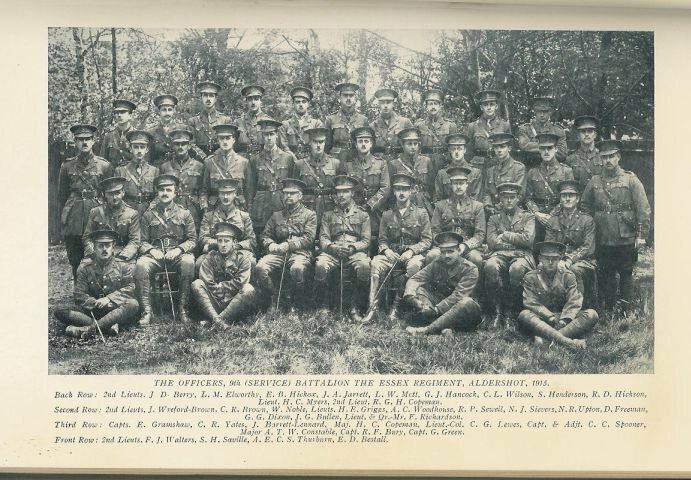 Frederick Elliot Brasted, 7th Battalion) and two other ranks died of their injuries." Source: Essex Units in the War 1914 – 1919, Service Battalions The Essex Regiment, Vol. 6, John Wm. Burrows, 1935, pages 9, 20, 46, 47, 72. A nice bonus, photograph from Burrows of the officers of the 9th Battalion taken in 1915 at Aldershot. Hickox is standing in the back row, 3rd from the left.